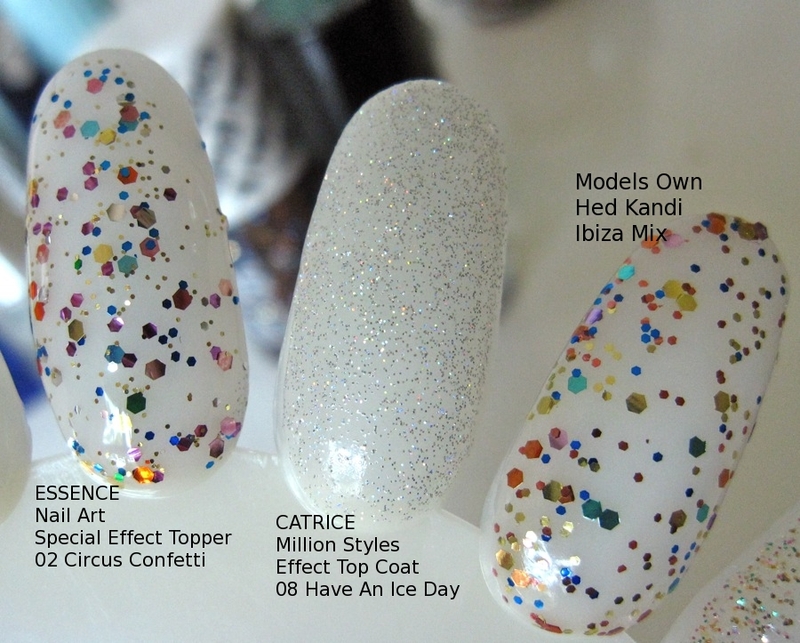 Recent, Kas sent me a nail wheel as part of a package of beauty goodies, so I used it to swatch my new nail polishes. Paul & Joe Nail Enamel 030 Pixie surprised me by its good coverage with just two coats. The holographic shimmer shows up very nicely. The finish is very smooth with no grittiness at all. 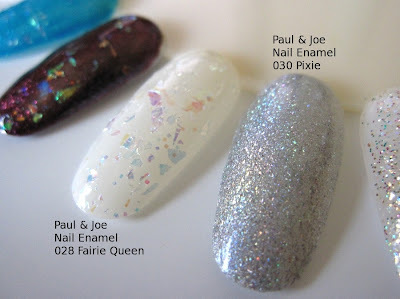 028 Fairie Queen has a thicker, more gloopy formula. This also feels bumpy due to the larger pieces of the irregular flakes. 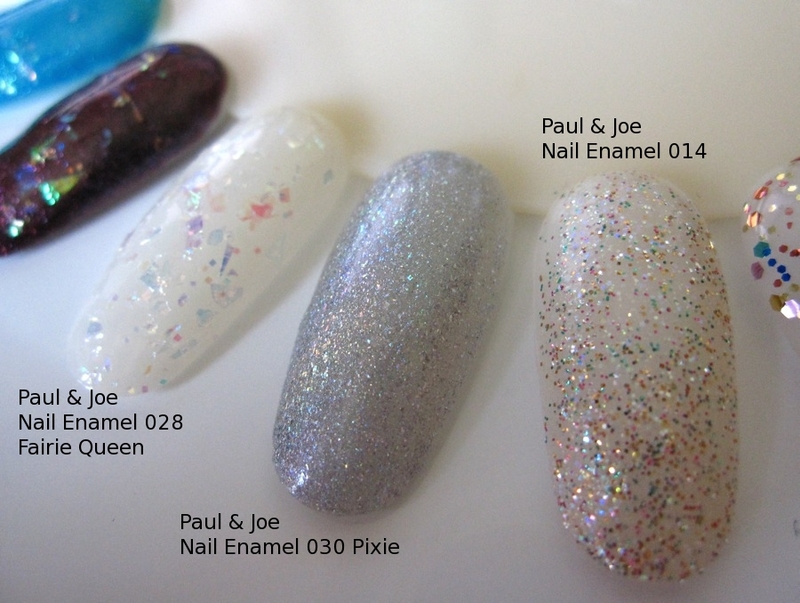 Comparing Pixie with Paul & Joe Nail Enamel 014 from the summer 2011 collection. 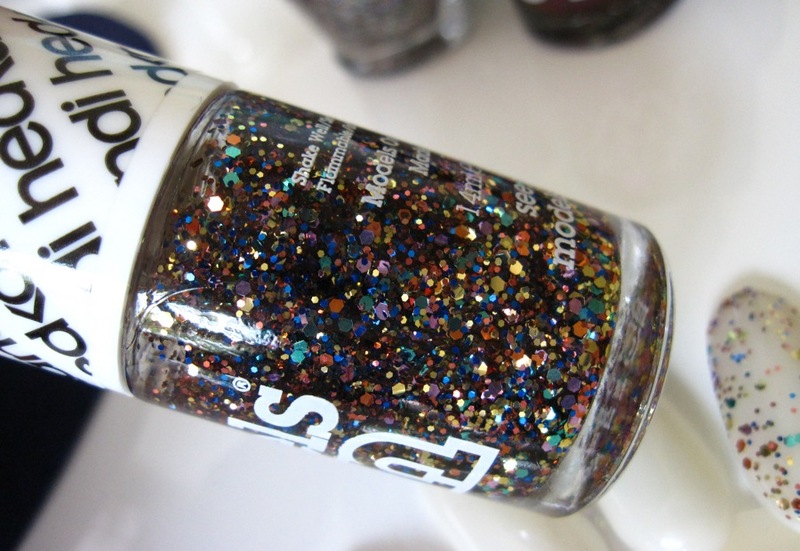 014 has multi-colored fine glitter bits and is sparklier than Pixie. At first, Catrice Million Styles Effect Top Coat 08 Have An Ice Day looks like a dupe for Pixie but it turns out to be much sparser in coverage than Pixie, which has a much stronger holographic effect. 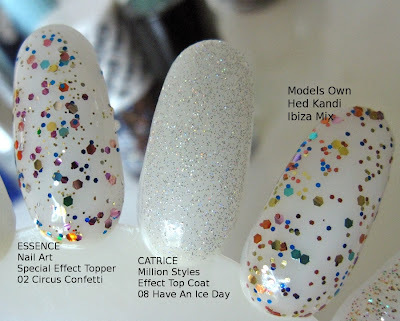 Have An Ice Day as a twinkling rainbow diamond shimmer effect. During my recent trip to London, I also picked up Models Own Ibiza Mix from the Hed Kandi collection. This usually retails at £5 but I snagged it at Boots with a 2-for-£8 offer. This is currently available on ASOS.com (but ships to only 19 European countries). 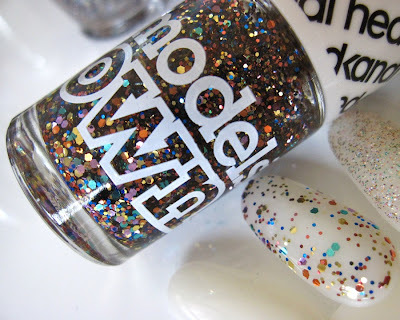 The rainbow glitter formula is quite common now, thanks to the success of Deborah Lippman's Happy Birthday. 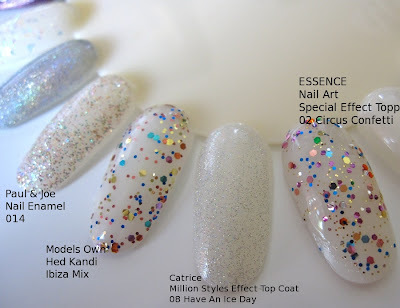 Within my own stash, I found a dupe in the form of Essence Nail Art Special Effect Topper 02 Circus Confetti. The Essence version is 8ml/0.27 fl oz and made in France while the Models Own version is 14ml/0.47fl oz and made in the UK. The main difference that I could spot is that Circus Confetti has smaller gold glitter bits than Ibiza Mix. 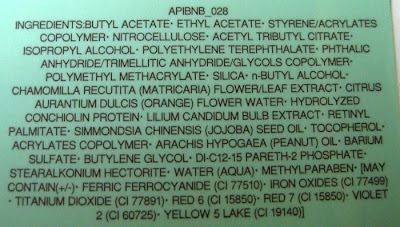 Below are the ingredient lists for Paul & Joe Nail Enamel 028 Fairie Queen, which is made in Japan. 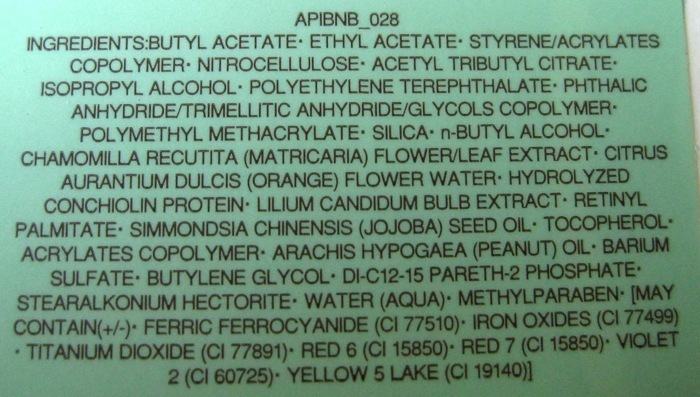 Hope these swatches are useful! 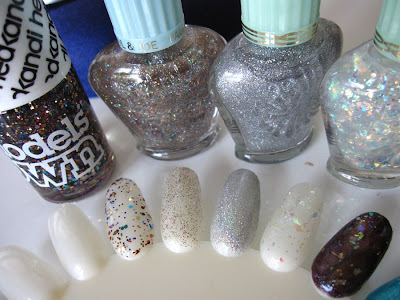 I love the swatches of Fairy Queen, especially the irregular shaped glitter. Yes this really helps, I'll definitely be getting Pixie, thank you! 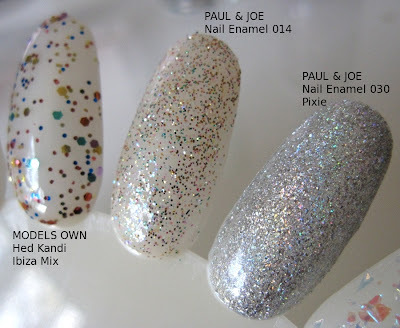 Paul and Joe 014 looks super pretty :) Nowadays I love glitter polish so much..
Great post, like always! I am very much impresses with your work.. Always good to have some nail wheels at hand! The day before you posted this, I had searched high and low on the Internet for swatches of P&J Faerie Queen and the other pearly swirly light green with pink flash, to no avail. 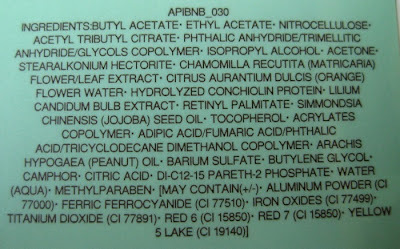 Thus, I really appreciate your efforts in this regard, as I've regretted many a P&J nail polish purchase due to inaccurate color depiction on websites and computer-rendered bottle shots...not many gals swatch these on nail-related sites. Thanks for these swatches, Haru! I really appreciate it. Are they scented just like the regular nail polishes of Paul & Joe? 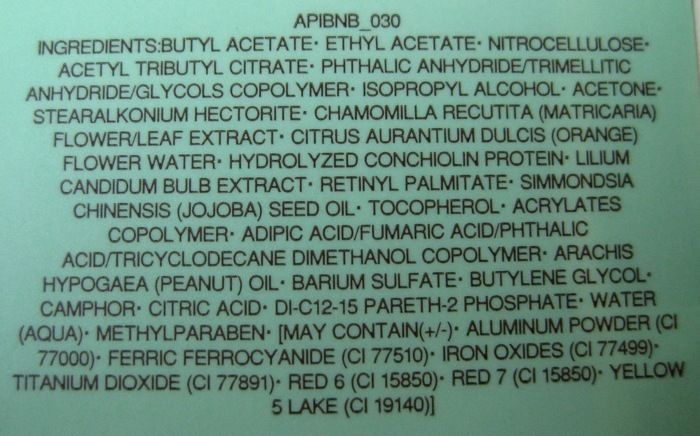 These do not have a special scent. 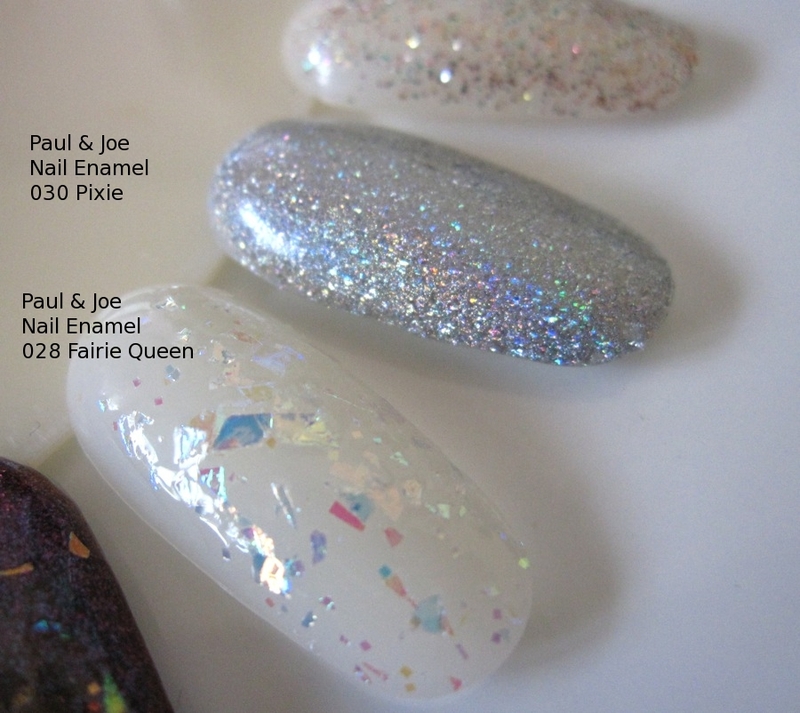 They smell like the regular Paul & Joe nailpolishes. Glad you found the swatches helpful! It's a pity that Paul & Joe remains very much a niche brand despite having very creative designs for their seasonal collections. Yes, I think I need to get more nail wheels. Do you know of any dupe for Fairie Queen? 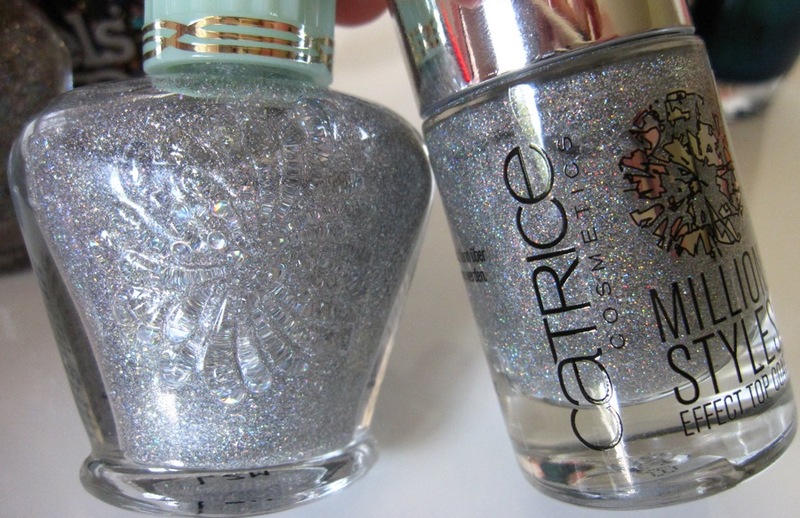 China Glaze Luxe and Lush from the Hunger Games collection looks very similar to Fairie Queen.